Health is a critical and important sector for people. With increased demand and limited resources, technology becomes a key factor. 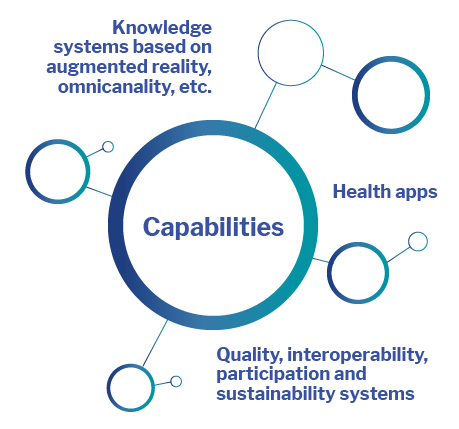 We believe that health information systems have to support a maxim: the patient has to be at the center of everything, providing quality systems, interoperability, participation and sustainability. Digital transformation in the health field should encourage or promote new types of services, based on prevention and home care. As far as the pharmaceutical sector is concerned, technological developments should focus on the creation of "knowledge banks" where both implicit and explicit knowledge should be concentrated. Digital transformation promotes new types of services based on augmented reality or omnicanality. working in the public health system. of the functional structure of the public health system. and control of shipment and production in pharmaceutical factories. for pharmaceutical laboratories and private health insurers. applied to the health sector. Predictive analytics in the service of health.